A Court Conversation, artist unknown, 1760, John Carter Brown Library. 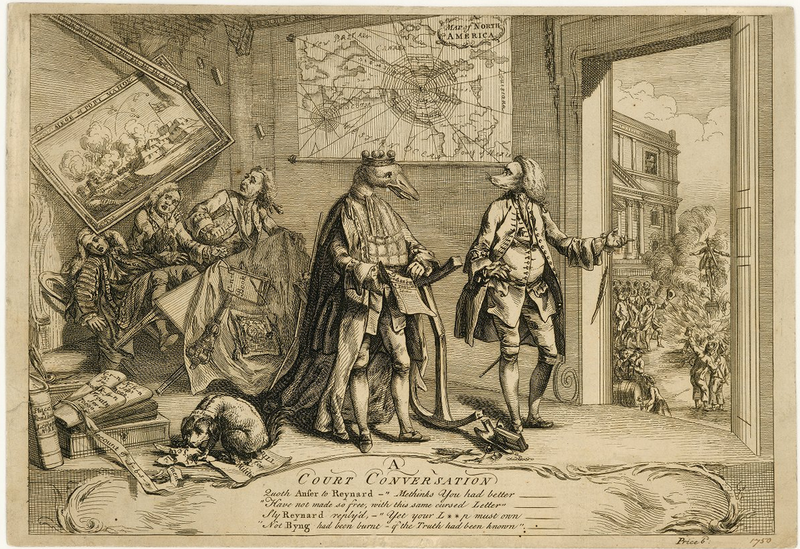 A pair of animal faced gentlemen discuss the conflagration beyond the door, where an effigy of Admiral Byng is being burned by a drunken rabble of sailors and soldiers. The text below the image implies that the vilification of Byng is unjustified, and lays the blame on heads higher up. The crowd does not know or care. Among the lot of riotous men are a small group of sailors cavorting about a cask of some spirituous liquor. 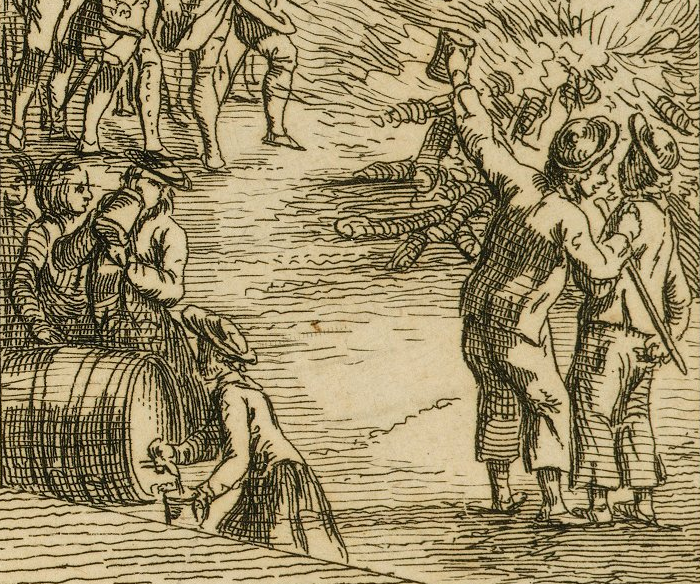 At the right are a pair of tar, one of whom gestures over the blaze with his tankard. Both wear jockey style caps (possible barge caps) and wear short jackets that end just below the waist with a double or triple vent in the back. Both are dressed in trousers that end at the calf, though at slightly different lengths. At the cask and working the spigot is another tarpawlin. He wears a low crowned round hat with a wide brim, and his jacket is similar to those of his mates to the right. Unlike them, he wears slops. Just behind the cask is a sailor in exactly the same outfit. The artist may be trying to imply that these are two separate messes or crews. The two on the right and the two on the left are dressed distinctly as sailors and in the same slop clothes as the sailor closest to him, but still wearing a visibly different garb from those across the small gap in the print.